Growing up in the small rural village of Yetebon, Ethiopia, Kidane Amare Sarko could step just outside his thatched-roof, mud and wood hut and see his future. He could see his father, who could neither read nor write, work in the field as a farmer. As the eldest boy in a family of seven children, Sarko fetched water, collected firewood and looked after the cows. Though he desired a different life for himself, it was difficult to imagine one. When he was 7 years old, the nonprofit organization Project Mercy built an elementary school in Yetebon and in doing so, established a path that, 20 years later, would lead Sarko out of Ethiopia to Vanderbilt University School of Medicine where he is enrolled in the Master of Public Health (MPH), Global Health program. How he got from there to here is a story of faith, hope and utter determination. At the time Sarko enrolled in the first grade in 1996, most households in Yetebon earned less than $50 USD per year. By 2011, that increased to about $300 USD per year due, in large part, to Project Mercy’s support. His house, which the family shared with its farm animals, had no running water or indoor plumbing. School was a welcome respite. “We couldn’t wait to wake up and go to school. Our parents didn’t need to tell us to go; we would be running to school,” he said. Sarko quickly learned the importance of education, peppering visiting U.S. student volunteers with questions and spending as much time with them as possible to learn English. He excelled as a student. When he finished grade 7, friends and neighbors pitched in to build him his own tukle (hut) so he could prepare for the grade 8 national exam that would allow him to attend high school. He scored in the 99.6th percentile on the exam and earned a 3.71 GPA. Representatives from a boarding school in Boston came to Yetebon to observe the top three students, including Sarko and two friends, to consider admitting them to the school. They ultimately selected just one. It wasn’t Sarko. Since there was no high school in Yetebon, Sarko enrolled in the preparatory high school seven miles away in the town of Butajira, moving away from his family for the first time, but not the last. In Ethiopia, when students finish high school, the government decides what and where they will study. Sarko had always wanted to become a medical doctor, but the government had other plans. Sarko completed three years of the five-year law school curriculum, volunteering with Project Mercy each summer, helping with a literacy program for adults and teaching health education. “We, the first batch of students, are the ones responsible for helping the next generation,” he said. He left after the third year of law school and volunteered full time with Project Mercy, as a “house father” to orphan children, despite having no guarantee that the agency would be able to send him to the U.S. to continue his education. “So instead of going to law school for the fourth year, I made a big, big decision. I’m almost so foolish, right? I was waiting and nothing happened for a whole year. Did I make a bad decision? Did I just ruin my life?” he wondered. In July 2011, the founder of Project Mercy called Sarko to tell him that Taylor University, a small Christian school in Indiana, had accepted him. “I was thrilled and happy. I didn’t doubt anything after I heard that,” said Sarko, who had two weeks to secure a passport and a visa and move to the U.S. He arrived, exhausted, at Taylor University on the first day of orientation and immediately began his life as a college student. Sarko was on the pre-medicine track, but it became clear that gaining admission to a U.S. medical school as an international student was not going to be easy. Taylor University had just implemented a new public health program and Sarko took a few courses to see what it was about. Sarko took the graduate school admission test and applied to nine public health programs throughout country, including Vanderbilt’s. Without waiting for an invitation, Sarko, 27, and a friend drove from Indiana to Nashville during spring break of his senior year to meet with Heimburger. “We were immediately impressed that Kidane is a man of humility and passion and vision. He clearly appeared eager to learn, enormously grateful for the opportunities he had been given, and hopeful that doors might continue to open for him,” Heimburger said. On April 7, 2015, Sarko received an email congratulating him on his admission to the MPH Global Health program at Vanderbilt University School of Medicine and informing him that he had received the David Satcher Public Health Scholarship. 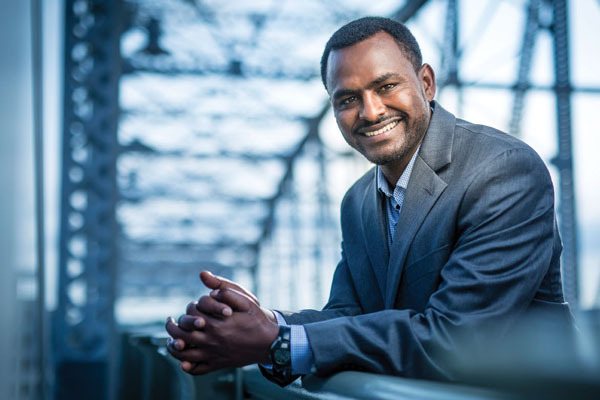 He graduated with honors from Taylor University in 2015 and returned to Ethiopia to visit his family whom he’d not seen in four years. Sarko has completed the first year of the MPH program and will graduate in May 2017. His plans include furthering his education and eventually returning to Ethiopia to care for his community.